Once the decision is made to sell your ranch, it is imperative to secure a company that is capable of handling the transaction effectively. 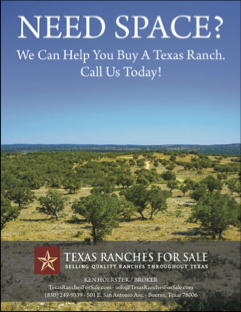 Since its inception in 2001, Texas Ranches For Sale (TRFS) has represented all types and sizes of ranches throughout Texas. Through the “TRFS Team” that has been assembled of knowledgable agents and a dedicated staff, TRFS has become one of the top brokerage companies in the state. 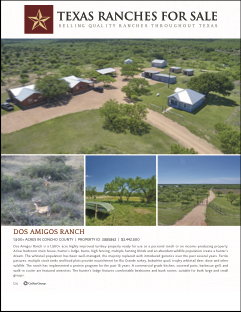 Dealing with ranches ranging in size from 15 acres to over 11,500+ acres, TRFS has implemented a well-rounded marketing plan that has a proven track record. While all real estate companies can advertise in the newspaper, TRFS extends advertising through multiple media sources at the local, state, and national level. With the internet, the playing field has changed and TRFS is on the cutting edge of this technology. Our website is consistently in the top ranking of the major search engines frequently accessed by buyers. This did not happen overnight, but through years of preparation to earn the recognition of specific internet service providers. The TRFS team plays a big part in making our company successful. We cover a large territory and are able to draw buyers through our broad list of properties. Listing - TRFS proposes an exclusive right of representation listing agreement. The listing term of twelve months is preferable. Commission - After the viewing of the property, a commission rate will be discussed for (1) if we sell the ranch with the Buyer being represented by another broker, and (2) if we sell the ranch without another broker involved. The fee provides incentive to both the Listing Broker (TRFS), and any subsequent co-broker --- whereby fees are generally split on a 50-50 basis. TRFS’s objective in pricing its fee is two-fold: (a) to charge a market typical rate that is based upon fair and reasonable compensation levels, and (b) to provide incentive to both in-house and outside brokers in order to sufficiently enlist full brokerage cooperation on the sale. TRFS works with other brokers and encourages full cooperation. Professional Photography - Having professional photographs taken of each ranch is an absolute necessity. We take the presentation of our client’s properties very seriously and believe in having the best looking and most accurate representation of every ranch. Multimedia Marketing - At TRFS we believe in the power of technology. With the capabilities of the internet expanding everyday, we are able to professionally present properties to potential clientele worldwide. We also publish listings in several credited publications including Texas Land Magazine and The Land Report. Each month, our “Blastout” newsletter is sent to a vast network with new, featured, and recently sold listings. As the internet continues to evolve, so does our web based marketing techniques. We aim to deliver the greatest amount of exposure per property through optimized search engine responses. Each listing is featured on an individual web page with a full description of the property and professionally taken full-color photographs. TexasRanchesForSale.com has recently undergone some major changes to include a better idea of what it means to both work for, and work with TRFS. As the website receives a lot of traffic and generates a considerable amount of business, it is constantly under scrutiny and maintainance. Additionally, we have added Google to our list of affiliates. We are now able to track website views, page views, and so much more data coming through the website through the use of internet analytics. This helps us define certain aspects of the market and target them with specific properties. 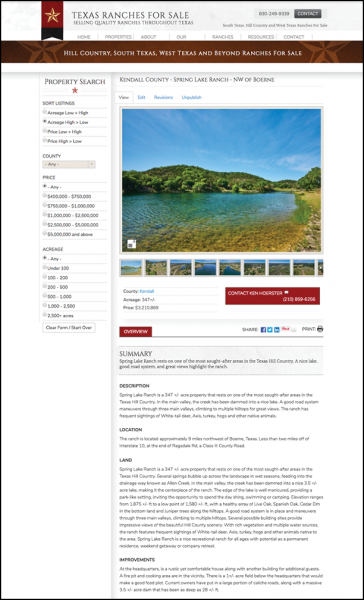 Along with the TRFS website, listings for each property is also displayed through LandsofTexas.com, MLS websites for San Antonio, Austin, Kerrville, and Fredericksburg, and the Texas Alliance of Land Brokers. 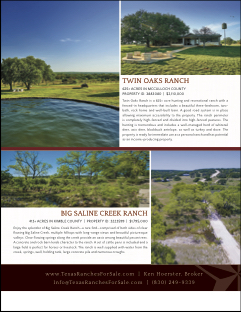 While the internet is a very powerful tool for marketing, TRFS also uses print advertising in several credited publications including Texas Land Magazine, Farm and Ranch Magazine, and The Land Report. These printed ads contain a full write up and multiple full-color photos of each listed property. Our monthly “Blastout” newsletter is sent to a vast network of brokers and interested parties each month. This newsletter contains an introduction with a link to an article related to the relevant news or issues that affect ranching, new listings, previously featured listings, and a sample of our recently sold listings.